In the array of pre-wedding functions, if there is something that the bride and her tribe enjoy the most, it is the Mehndi. While prepping for Mehndi includes everything from arranging floral jewellery, selecting the outfit and having a cute photo booth with props, the most important element is choosing a good mehndi design for your big day. When it comes to henna designs, brides have their own preferences. Some like a simple mehndi design, while others want to go all out with an intricate bridal mehendi design. Whatever may be your liking when it comes to mehandi designs, we have you covered with our top 50 mehandi design images that we spotted on real brides. This list of mehandi designs includes everything from glitter henna to the very popular Arabic mehndi design that is loved mostly by the friends, aunts and cousins of the ladkiwale! Scroll through and pin all those designs that you want to show your mehndi artist for your wedding day. Bridesmaids and other rishtedaar too can check out these henna designs as there are lot of pics with minimal mehendi design too! Did you notice the skyline of two cities on this bride’s forearm? 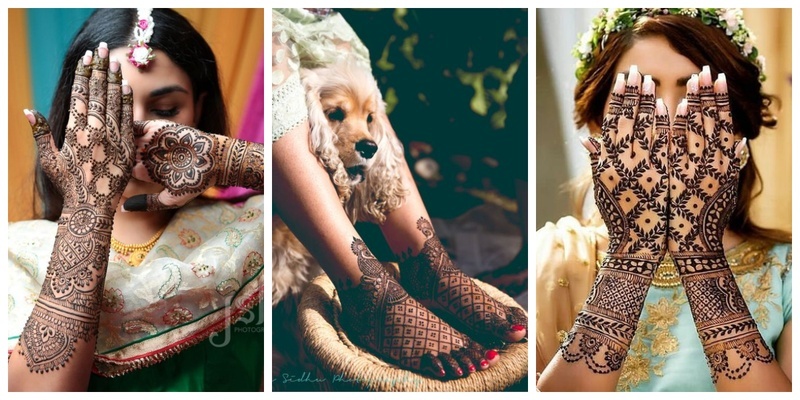 Such a cool idea for personalising your bridal mehndi design, right? Also, the lotus motifs throughout this henna design are so amazing! Full of floral, leaf and paisley motifs, such kind of Indian mehndi designs never go out of style. They are traditional, intricate and beautiful all at once. Have you always dreamt of having your hands painted with henna till the elbows for your wedding? Well, if you have, then this kind of intricate full hand mehndi design is just for you. Get yourself a stunning nail art like this bride to match you traditional Indian mehndi and revel in the compliments you receive! This traditional dulha dulhan mehndi design has been around for ages, and for all the right reasons. It is traditional, full of beautiful motifs and intricate enough to give you a bridal mehndi kind of feeling! Beautiful vines of floral design woven across this hand mehndi! What’s not to love? Paisley, hearts, flowers and leaf vines are never going out of style for bridal henna designs, and for all obvious reasons. They have this amazing bridal look that other mehndi designs don’t. This bridal mehndi design is all about flower power. The beautiful floral motifs of roses, lotus, leaves and vines make this mehandi design a perfect floral package! I, for one, am totally loving how this mehendi design has been personalised by the bride to replicate the first date with her hubby-to-be! And the dancing dulha dulhan mehndi figures on her forearm; my gosh, I’m sold! 9. Full of paisley. Full of beauty! This mehndi style is definitely for the bride who doesn’t mind an overdose of the staple Indian mehndi motif of paisley! This of hand-down one of the best intricate bridal mehndi designs of 2018. The elaborate mesh motifs and minimal floral pattern makes this top the list of bridal mehndi designs for full hands. 11. These Varmala mehndi figures are just too cute! The varmala ceremony captured in a beautiful mehndi design! How cool is that? 12. A leg mehndi design that’s oh-so-gorgeous! An intricate leg mehndi design with all the motifs of a traditional Indian bridal mehendi! For brides who like to keep it minimal, this is one of the best and simple bridal mehndi designs to take inspiration from! A simple mehndi design that’s not too cluttered is perfect for the bride who wants to add some drama to her henna design, but doesn’t want to go too overboard! 15. Intricate bridal mehndi design that has me totally heart-eyed! If this is not a work of art, I don’t know what is! Just look at this beautiful bridal mehndi for full hands and legs that’s as intricate as it gets. The stunning jali-style work with dulha dulhan figures, paisley and floral motifs is totally #bridalhennagoals! If you the bride who wants the best of every mehndi motif, then a bridal henna design like this one is your best bet. It has everything from lotus and leaves to beautiful jali work floral design. This leg mehndi design is so stunning and neatly made that all I can say is WOW! The gorgeous peacock motifs along with the lotus design all over makes it the perfect Indian mehndi design for brides! These mehndi figures of the dulha putting sindoor in the dulhan’s head is totally cute. If you are a lover of mehndi designs with bride and groom figures, then its perfect to opt for figures performing traditional wedding rituals like pheras or varmala rather than just dulha-dulhan portraits. Just beautiful geometric lines of heena and curves of paisley running across the arms for this bride. If you are looking for bridal mehndi designs for full hands front and back, then this beautiful design right here is a great inspiration for the backside of your hands. It is intricate and has all the motifs of an Indian mehndi. 21. Personalised mehndi for those who like it quirky! I’m literally bowled over too with the creativity of this henna design. This kind of wedding mehndi is the latest trend among brides who love to add a personal touch to their bridal henna. While both these brides kept their love for floral motifs intact, they added a hint of personalisation to their bridal henna by adding coffee cups and Audi symbol and wedding date respectively! You too can add a small element of something you like in your wedding mehndi to make it special. A simple round mehndi design with accents of beaded string motifs looks truly stunning on this bride’s feet. If you prefer a simple yet gorgeous look for your feet mehndi, then this one is a great design to take inspiration from. For nature loving brides, this mehndi design with leaves and flower motifs that form a lovely net pattern is just perfect! This bride has added a personal touch to her wedding mehndi by adding a cute motif of the Golden Gate Bridge and writing the word LOVE! I’m guessing she and her hubby-to-be fell in love at the bridge? :D If you are a fan of personalised henna too, you can try something cool like this to tell your love story with your bridal mehndi. As a mark of their eternal love, this bride decided to make a design of the ultimate symbol of love: The Taj Mahal. She also added her name as opposed to just the hubby’s name! Way to break the rules, girl! Replete with peacock motifs and beautiful paisley patterns, this rajasthani mehndi design is for brides who love to have a hand full of henna art on their wedding day. For brides who want to include images of gods or goddesses in their bridal mehandi, such designs are the perfect inspiration! If your bestie or sister is getting married and you want to try something hatke, then these beautiful glitter mehndi designs are perfect for inspiration. They look different and all the bride’s BFF’s can get this one for everyone to spot the bride tribe! If you’re feisty enough to try the white henna trend, then by all means go ahead and check out these beautiful white mehndi designs for your inspiration! This one is perfect for the bridesmaids to stand out too! Did any of these latest mehandi designs give you major #bridalhennagoals?